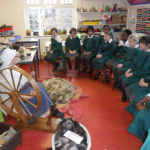 In January, children from the Reception classes and Years 4,5, and 6 enjoyed a visit to Lyonsdown School by spinning expert, Anne Martin (Grandmother of Katerina in RG) who works at Quarry Bank Mill which featured in the television series ‘The Mill’. Anne gave a wonderful talk to each year group explaining what life would have been like for children working at the Mill 300 years ago. She also demonstrated how fleece is spun into yarn. 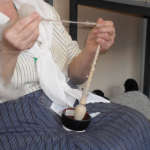 Pupils learnt about different breeds of sheep as well as how to shear a sheep and everyone experienced carding fleece before using the spinning wheel to produce beautifully spun wool, ready for knitting or weaving . 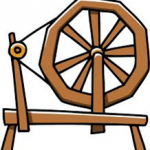 Anne also bought in various types of spindles from around the world which the children found fascinating. We very much look forward to welcoming Anne back to Lyonsdown in the near future as the pupils found her workshop fun, inspiring and interesting.